The Graphic : Surf Boats, Accra, Ghana, 1891-1894. Issue 1133, pages 196 and 198. Issue 1259, pages 36 and 38. British Library: British Newspapers 1800-1900. Importantly, the surfboat image (sketch by Airey, engraving by Nash, 1891) shows virtually an identical craft, with the same "forked" blade paddle design, as featured as native fishing boats in a segment of Bruce Brown's The Endless Summer (1966) filmed in Ghana. While Brown's narration suggests that the local fisherman are normally adverse to riding waves in their fishing boats, inspired by the visiting American surfboard riders (Robert August and Mike Hynson), they do so on this occassion. The historical evidence would indicate that this was not the case, and wave riding was the common method of returning to the beach. The Ghana sequence also shows juveniles riding waves on small prone boards, consistent with Alexander's account (page 192). According to the narration, this was also inspired by the surfing of August and Hynson and in their enthusiasm the young natives pull wooden panels from their houses to use as surfboards. It is probable that this was dramatic license on Brown's part, and that juvenile surfing was already a common practice before the arrival of the American surfers. As of 1947, the surfboats of Accra were still in use for the freighting of goods offshore. "In an old German educational film surfboats are seen loading a Dutch ship of the Holland West Afrika Lijn. I wonder whether it is still customary to load ships there that way nowadays." Saturday, August 15, 1891; Issue 1133, page 196. Page 196 THE WEST COAST OF AFRICA: LANDING IN A SURF BOAT AT ACCRA. Amongst the anchorages in open roadsteads of the west coast of Africa is that of Accra, the seat of the Govenment of the Gold Coast. Owing to the heavy surf braking all along the beach, it is impossible to land in any ordinary ship's boat, and, therefore, on the ship hoisting the signal - the Zanzibar ensign at the fore - a native surf boat shoves off from the shore to meet the approaching ship's boat just beyond the surf. Having received its living freight, the surfboat commences her retum to the shore. She is a large, stronly-built open boat, manned by ten natives with short wooded paddles, and steered by a 'boatswain,' who uses an ordinary oar in place of a rudder. As the boat is propelled through the water by the paddlers, the crew keep time with a musical chant. Nearing the beach, the boat arrives amoungst the breakers, and then comes the tug of war. The "boatswain," every nerve and muscle strained, steers her wIth unerring eye, the crew with a will work their paddles and shoot her like a rocket through the heavy surf. At last, within from twenty to thirty yards from the shore, the song ceases and the paddles are stopped, until a huge breaker comes up surging and roaring from stern. 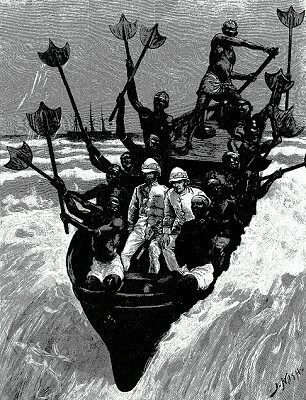 As it reaches the surf boat, it lifts her on its crest like a cork; the crew throw up their paddles with a loud yell; and allmost before your are aware of it, the boat is landed on the sandy beach, and you are in the arms of two stalwart natives who - with or against your wili - carry you up clear of the succeeding wave, which sometimes turns the boat completely over. - Our engraving is from a sketch by Mr. Fred W. J. Airey, H.M.S. Magpie, Fernando Po. LANDING IN A SURF BOAT AT ACCRA. Saturday, August 15, 1891; Issue 1133, page 198. The "engraving is from a sketch by Mr. Fred W. J. Airey, H.M.S. Magpie, Fernando Po." FOR SIERRA LEONE BY SURF BOAT. Illustration by "an English Officer". An Officier of the East India Regiment: Life on the West Coast of Africa. Saturday, January 13, 1894; Issue 1259, page 39. The Castle must have been strongly fortified for those times, and fully capable of resisting the invasion of pirates, as the old guns have a good command of the only practical landing place; heavy surfs are frequent all down the coast, and make the landing very dangerous. The native crews are very skilful with their paddles, and manage to get through somehow; but many lives have been lost by the capsising of the boats." Geoff Cater (2011) : The Graphic : Surf Boats, Accra, Ghana, 1891-1894.